I hope you had a lovely weekend. Today I thought we would ease into the week with something soft and comfortable. Jersey. It's a great fabric that skims and hugs the body where you want and, more importantly, machine washable. Let's look at some jersey skirts that are great for a casual weekend brunch or dressed up for work. A beautiful navy marl with a simple twist front. Easy and effortless. And you didn't believe you could wear jersey to work. 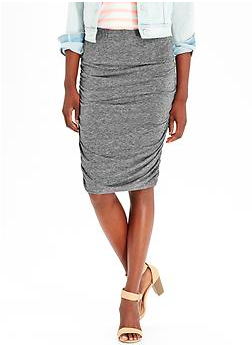 Again a great versatile skirt that also comes in a slate gray. Comfortable doesn't mean lazy or frumpy. 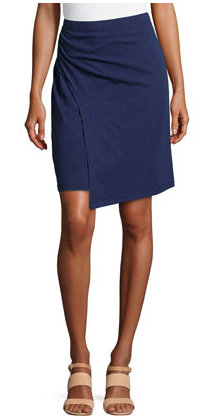 These fitted jersey skirts are ready for work or play and super sweet for spring.